The death toll in Syria has risen to more than 2,900 people since the pro-democracy protests began in March, the United Nations human rights office has said. The UN had previously put the death toll at 2,700. On Tuesday, the UN Security Council failed to agree a resolution on taking action against Syria. Opposition activists said 16 people died in different parts of the country on Wednesday as protests continued. President Bashar al-Assad has cracked down on them, blaming the unrest on "terrorists and armed gangs". But he announced that local elections would be held in December. Correspondents say this is unlikely to be acceptable to the protesters. 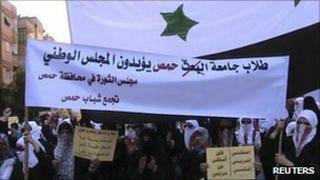 Many of them have stopped calling for reform, and are instead insisting on the overthrow of Mr Assad. As activist networks reported more clashes on Thursday between forces loyal to the Syrian president and army defectors, videos surfaced of protesters burning Russian and Chinese flags - a reaction to the two countries' veto of the UN Security Council resolution on Syria. A spokesman for the UN human rights office, Rupert Colville, said of the latest death toll that the names of the dead had all been confirmed and could include some members of the security forces. He said the figures did not include those who had disappeared or remained unaccounted for. The announcement came a day before the UN Human Rights Council in Geneva reviews Syria's record. Meanwhile the BBC's Jim Muir, who is monitoring events in Syria from neighbouring Lebanon, says the government in Damascus is celebrating two big propaganda victories. The state-run Syrian media are still playing up Russia and China's veto, with top officials clearly delighted, calling it a "historic" development dealing a blow to Western schemes for intervening in the country's internal affairs, our correspondent says. Syrian state TV is also gleefully dwelling on the case of Zainab al-Hosni, the 18-year-old girl from Homs who was reported by her family and by human rights organisations to have been detained, beheaded and mutilated, he adds. She later appeared on Syrian TV to say she was alive and well.